Don Williams, Aleppo, 2017, stoneware, metal, ceramic shard, 13" x 18" x 12”. Courtesy photo. Two new exhibitions, Scott Schnepf: Four Decades of Printmaking and The Artists Revealed: 2018 Studio Art Faculty Review will be on view at the Museum of Art, University of New Hampshire beginning November 1 until December 16, 2018. A reception will take place on Thursday, November 1, 5:00 p.m. - 6:00 p.m. The Museum of Art and programs are open to the public free of charge. The Museum will be closed November 21-24, 2018. Scott Schnepf, Postcards, 2018, woodcut, 30” x 30". Courtesy photo. Throughout his distinguished career as an artist and teacher, Scott Schnepf, who taught in the Department of Art and Art History from 1981 to 2015, has developed a rich body of prints exploring techniques and subjects. 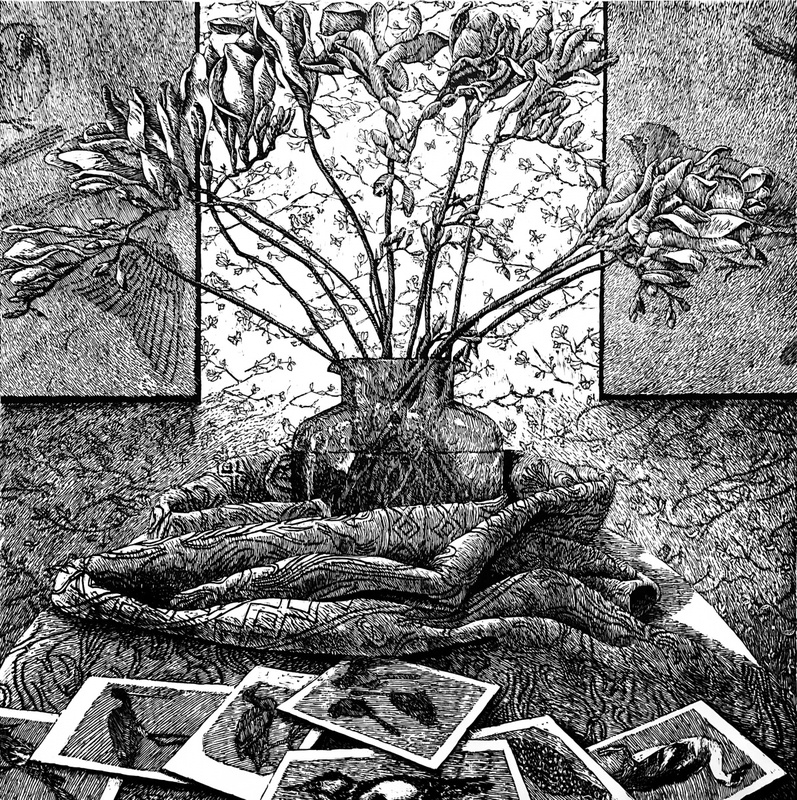 This exhibition celebrates nearly forty years of printmaking including airy landscapes, intimate domestic interiors and his well-known densely layered still life arrangements that reveal an observant and imaginative master draughtsman. Schnepf will be giving an artist talk on Wednesday, November 28, 12:10 p.m. - 1 p.m. This exhibition of work by the artists who teach in the Department of Art and Art History reveals the breadth and range of the department’s studio art program. The participating faculty members are professional artists, involved in national and international exhibitions while serving as mentors to undergraduate and graduate students at the University. This exhibition highlights the broad scope of the department’s visual voice and creativity. Exhibiting artists include: Jennifer Moses, Sachiko Akiyama, Jason Bombaci, Jamie Bowman, Benjamin Cariens, Michael Cardinali, Bradley Castellanos, Brian Chu, Richard Fox, Grant Drumheller, Julee Holcombe, Don Williams, Leah Woods, and Liese Zahabi. All faculty members will be presenting a series of artists talk throughout the duration of the exhibition. Beginning on Wednesday, November 7, 12:10 p.m., Jennifer Moses, Sachiko Akiyama, Jamie Bowman, Michael Cardinali will discuss current work and studio practices. Bradley Castellanos, Brian Chu, Rick Fox, Grant Drumheller, will present on Wednesday November 14, 12:10 p.m. - 1 p.m. And Julee Holcombe, Don Williams, Leah Woods, Liese Zahabi, on Wednesday, December 5, 12:10 p.m. - 1 p.m. All talks will take place in the Museum of Art. Exhibitions and accompanying programs are supported by Friends of the Museum of Art. The Museum of Art hours of operation during the academic year: Monday, Tuesday, Wednesday and Friday: 10 a.m.-4 p.m., Thursday: 10 a.m.-6 p.m., Saturday: 12 - 4 p.m., Closed Sunday; closed University holiday. Follow the Museum of Art on Facebook, Twitter and Instagram #MOAUNH. The Museum will be closed November 21-24, 2018.